Coast Mountain Bus Company, an operating subsidiary of TransLink, provides bus and SeaBus service in the Metro Vancouver area. The company commenced service on April 1, 1999 when the Vancouver Regional Transit System was split from BC Transit, thus creating CMBC. The Coast Mountain Bus Company was formed on April 1, 1999 when the Greater Vancouver division of BC Transit was split from the rest of the BC Transit network. Before its current name, it was called "BusLink" for 9 months during transition into TransLink. Coast Mountain Bus Company provides service in all 21 municipalities that make up Metro Vancouver (the former Greater Vancouver area). These are: Anmore, Belcarra, Bowen Island, Burnaby, Coquitlam, Delta, City of Langley, Township of Langley, Lions Bay, Maple Ridge, New Westminster, City of North Vancouver, District of North Vancouver, Pitt Meadows, Port Coquitlam, Port Moody, Richmond, Surrey, Vancouver, West Vancouver, and White Rock. Shortly after the delivery of the New Flyer E40LFRs, the company experienced a major shortage after a power steering malfunction affected several of the new units. As a result, 65 units were pulled out of service and several units from other garages were transferred to Vancouver Transit Centre. In addition, a handful that had been retired were sent to the garages that had donated units. 2 Orion Vs from Central Fraser Valley Transit System, and 2 Orion Is from Chilliwack Transit System were also brought over. With the introduction of the Canada Line, most 400-series express routes were discontinued. This, in turn, allowed TransLink to reallocate various resources (units, service hours) to other routes, such as increasing frequency on routes like 351, 601, 401, and 410. The re-numbering of Community Shuttle "C-Style" route numbering began subtly in 2011 with route 337 being re-numbered from its old route number, the C74. Between 2011 and 2016, new Community Shuttle routes were implemented without the use of the C-numbering system, such as the 227 in 2013 and the short-lived 178 in the same month. A bulk of re-numberings took place during the December 2016 Service Changes  as a result of the Evergreen Extension bus integrations and the 2016 Transit Network Review for Downtown Vancouver - West End. All remaining C-numbered routes were renumbered during the September 2018 Service Changes, ending the use of the C-numbering system. Coast Mountain Bus Company operates most bus routes across Metro Vancouver. West Vancouver operates its own municipal transit service and a select number of Community Shuttle routes are contracted out. Service is provided using a large fleet of conventional diesel, compressed natural gas, and electric trolleybuses, in addition to gasoline Community Shuttles. The B-Line service is a system of express bus routes using low-floor articulated buses. B-Line routes have bus rapid transit elements and run frequent service for most of the day, seven days a week. All B-Line routes as of January 1, 2018 feature all-door boarding at all stops. The first route, the 99, was introduced in September 1996 and went from the University of British Columbia to Lougheed Mall in Burnaby via Broadway Station and Brentwood Mall along Broadway and Lougheed Highway. B-Line routes were later introduced along other major corridors in the new millennium with the 98 B-Line in September 2000 and the 97 B-Line in September 2002. The 95 is the newest that connects Simon Fraser University in Burnaby with Burrard Station in downtown Vancouver along Hastings Street. The 96 is a major arterial route operating in Surrey, connecting Guildford Exchange and Newton Exchange with the Expo Line at Surrey Central Station and King George Station. The 99 is a major arterial route connecting the University of British Columbia and Commercial–Broadway Station in Vancouver and is the busiest route in the system. There are plans to replace a portion of the route with SkyTrain service by extending the Millennium Line to Arbutus Street. 97 B-Line: Connected Lougheed Station and Coquitlam Station. Service replaced in 2016 with the Evergreen Extension and following re-organization of bus routes within the tri-cities area. Route numbers have yet to be determined for both proposed future B-Line routes and 2019 B-Line routes. Scott Road: Service from Scott Road Station along Scott Road to Scottsdale Exchange, 72nd Avenue to Newton Exchange. 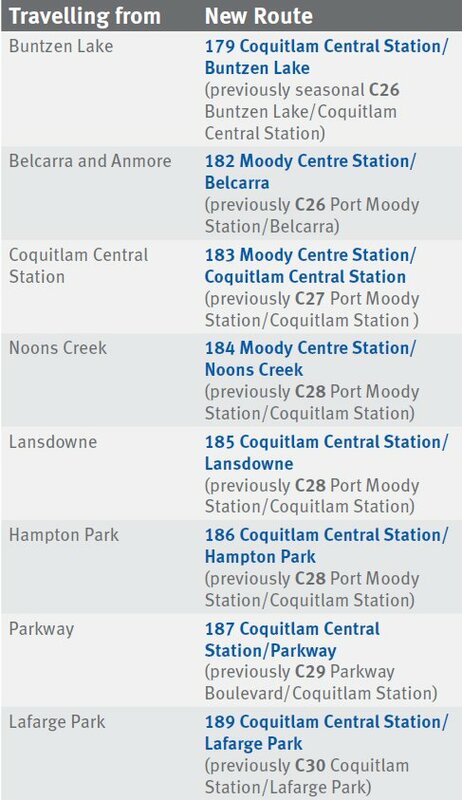 Langley–Coquitlam Central Station: Langley Centre to Coquitlam Central Station via the Golden Ears Bridge and Pitt Meadows. Community Shuttle is a minibus service offered by TransLink and operated by Coast Mountain Bus Company, with a select number of routes operated by a private contractor. Introduced in September 2000, the Community Shuttle was a cost-effective solution to providing bus service on routes that had low ridership and were expensive to operate. The Community Shuttle service maintains transit coverage while operating a smaller vehicle with lowered costs and serves as a method of traffic calming in quiet, residential areas. Initially introduced in the Burnaby Heights area, the Community Shuttle service has expanded to operate in every city in Metro Vancouver, both as a replacement for low performing routes and as new service in communities that lacked transit service. Covering more ground than three SkyTrain lines, the NightBus service provides overnight coverage for all three SkyTrain lines and major corridors. NightBus routes meet in downtown Vancouver and operate about every 30 minutes or better, seven days a week. NightBus routes are identifiable with the letter N in front of the route number. On maps and signage, they are marked with a dark shade of blue. During the BC Transit era, the NightBus service was referred to as "Owl" routes, with route numbers and names remaining the same. The Owl term was used up until 2001, when Owl routes were cut due to a funding shortfall. In 2004, the Owl service resumed and was branded as NightBus. Introduced in 1977, the SeaBus is a passenger ferry service that connects Waterfront Station in Vancouver and Lonsdale Quay in North Vancouver across the Burrard Inlet with a crossing time of about 10 to 12 minutes. Service operates seven days a week and every 15 minutes for most of the day and every 30 in the early morning and late evening. As of 1996, all conventional units (except trolleys and demonstration units) are numbered in the "permanent" numbering system, with the first letter in the fleet number denoting its garage. Though some inconsistencies arise during a transfer, the prefix is usually fixed within weeks after. However, the "T" prefix is not used to identify the garage it runs out of; it is instead used to identify vehicles that are used specifically for training purposes or, before 2014, HandyDART vehicles. Similarly, the "S" prefix was formerly used in conjunction with a three- or four-digit fleet number to identify Community Shuttle vehicles, regardless of garage. The first 2 numbers for 2012 or later units denote the order year and may not reflect the actual manufacture year. For example, unit 12020 was manufactured in 2013 but is part of a 2012 order. *The S prefix was also used on pre-2016 Community Shuttle vehicles to denote "shuttle." **The T prefix was also used on pre-2014 HandyDART vehicles. As of 2008, all units are equipped with a voice announcement system to aid those visually impaired and unfamiliar with the region. This also allows operators to drive without having to make announcements. GPS technology is used to detect a unit's location in relation to its next stop. 3312, 3348, & 3356 were repowered with Cummins Westport ISL G engines. 7299 transferred to WVMT as 990. Originally had Cummins ISC engines. 8010 had a Balios Orange LED sign. 8058 & 8084 had Detroit Diesel Series 50 EGR engines. 9601–9604 transferred to WVMT as 703–706. Entered service on April 29th, 2013. 16131, 16132, 16134–16136, 16138–16140 transferred to WVMT as 1606–1613. First buses in CMBC fleet to carry new suburban livery. Vancouver is the last city in Canada to operate trolleybuses in revenue service as of May 2009. 27 units to replace aging Orion V units, 5 as expansion units. S501 entered service October 15, 2014. Order delayed from 2015 to 2017 due to IC Shuttle Bus crisis. 17549–17569 operated by First Transit. To enter service in late 2018 or early 2019. 18510 to 18516 are operated by First Transit. 18517 to 18527 are operated by Coast Mountain Bus Company. Coast Mountain Bus Company also operates 3 passenger ferries known as the SeaBus. Beginning operation in 1977, the 2-zone service connects Waterfront in Vancouver and Lonsdale Quay in North Vancouver. Service is 15 minutes daily and every 30 minutes at night and on early weekends/holidays. The crossing takes around 12 minutes and also offers a vast selection of scenery from multiple angles on the Burrard Inlet. Burrard Beaver 1976 Yarrows Shipbuilders Ltd.
1002 was part of a rejected Oshawa Transit Commission order. Demonstrated with diesel particulate filters with CMBC from November 2005 to May 2006. To Durham Region Transit as 8173 & 8172 in August 2006. Demonstrated with CMBC in early 2007. Later sold to Ulster County Area Transit as 42. Demonstrated with CMBC from June–August 2017. Were scheduled for in-service trials on lines 301, 311, 351, 354, 555, 601, 620 from November 2017 to March 2018. 1207 transferred to WVMT 207 in 1999; returned in 2000. 1210 transferred to WVMT 210 in 1999; returned in 2000. All retired and scrapped in 2010. 3101–3110 & 3154–3175 had suburban configuration. 3102 donated to Thompson Rivers University. 3122 sold to Cypress Coach Lines. 3118 donated to Justice Institute Maple Ridge. 3147 sold to the Canadian Armed Forces. 3139 sold to the Vancouver Fire Department. 3155 sold to Valley Express. Retired and scrapped in 2010. Some units designated D40 CNG on build plate. Originally had Detroit Diesel Series 50G engines. 3262, 3264, 3266, 3270–3272 to Southland Transportation in October 2011. Originally had Detroit Diesel Series 50G engines and Voith D863.3 transmissions. 3288, 3292, 3302, 3306–3308 were retrofitted with Cummins Westport C Gas Plus engines in 2001 . 3283–3287, 3289–3291, 3292–3299, 3301, 3303–3305 were dieselized and recieved Detroit Diesel Series 50 EGR engines and Allison B400R5 transmissions in 2009. First units to be equipped with wheelchair lifts. 4254 retrofitted to a Voith D863.3. Originally equipped with Allison VS2-6 transmissions. Leased from BC Transit during the Vancouver Trolley Crisis of 2007. 7244, 7246 converted to diesel-electric in 2004; 7245 returned to Ballard. 7244, 7246 were placed in storage in 2010 and scrapped in December 2012. Transferred to WVMT as 981. Demonstrated with CMBC from November 2006 to June 2007. Demonstrated with CMBC from May to June 2008. 2805 and 2812 preserved by TRAMS; 2812 scrapped. Operated by Bonny's Taxi Ltd. Original S004 was a 1996–97 CBB Polar (ex-BC Transit C595) operated by Bowen Island Community Transit Ltd.
S302–S304 have longer bodies, higher seating capacities, and were the last remaining active units, operated by First Transit. Formerly numbered S401 as demonstrator. Had various problems with gas fumes leaking into the cabin area, and were pulled out of service after two to four years of service. Some units were used as training vehicles prior to sale. 11 units sold to Landsea Tours. Burrard Otter 1976 Burrard Dry Dock Ltd.
↑ TransLink Open Board Meeting, June 23, 2017. Dated June 23, 2017, retrieved on August 18, 2017. This page was last modified on 17 April 2019, at 23:13.